Offering you a complete choice of products which include file folder, office file folder, a4 expandable file organizer, file folders with 5 pockets and 13 pockets expanding file folder. 1.The poly file folder holds up to 1000 sheets of paper total, and it provides 13 individual pockets for reliable partitioning. 6 kind color Bit of a group,The pockets are tabbed to allow for adding handwritten labels, ensuring each section can be instantly identified for quick access. 2.Each pocket offers a generous amount of space, expanding to 7/8 inches. From homework assignments to presentation documents or household records and receipts, the expandable file folder has you covered. 3.Size:, 13X9.5X1.5 Inches, which makes it suitable for daily filing and storing of documents, Accordion File Organizer Fit A4 Size and Letter Size.Ideal for school, work, or home, this expanding file folder makes it easy to get organized. 4.Made of high quality Polypropylene (PP) material (nontoxic and nonradioactive) which is light and tough, waterproof with the capability of protecting documents in a long run. 5. 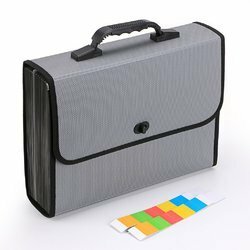 Telescopic handle and button for easily carrying and storaging, Large-capacity file folder is your good assistant in your office life. feel more comfortable, durable deformation. Usage/Application Suitable for home school office personal gifts souvenirs and other occasions. 1. Each folder has 5 pockets，Provides a lot of space for storing important files or document.Divide files into different categories and keep the files neatly arranged. 2. Cute solid color smiley design, colors can be applied to various occasions. 3. Each pocket has an organizational label for differentiation, ensuring that each part is immediately recognized for quick access. 4. Featured close button to prevents files from falling out during the move,increase storage security. 5. Suitable for home, school, office, personal gifts, souvenirs and other occasions. Specification: 【Size】12.8(L) x 9.6(W) x 0.8(H) inches, fit A4 size and Letter size, up to 150-200 pages. 【Color】4【Material】Durable PP material. Provides waterproof, Moisture-proof, and tear resistance. Outer packaging: Each of our folders is wrapped in a transparent bag, which is the first layer of protection. Together with the exquisite packaging box, it not only protects the folder from being damaged during transportation, but also the exquisite packaging is very good even as a gift. Just like this folder "smiles", we hope that every customer who receives our products will like them, showing a happy smile, this is the original intention of our“Initial heart”. We are committed to making every customer who buys a product in our store have a very good shopping experience. Our briefcase is made of high quality polypropylene which is very durable, environmental, recycable, wear-resisting and practical. 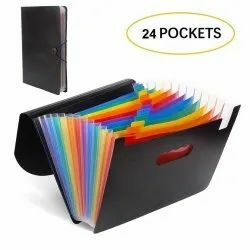 It has 12 file folders with memory tabs of 12 different colors, ensuring variety when in use and plenty of space to place your files. You can carry on this folders with you on the way to your office or school classroom, also ideal for your business trip or in your department office, school lab. 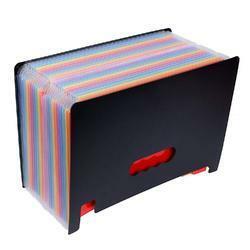 It keeps your papers, documents inside organised, neat, vertical and easily accessible. 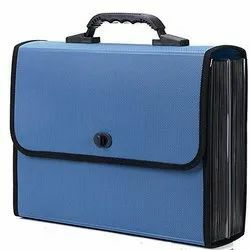 Basic Information Material: Polypropylene Color: Blue; Blue Product weight: 304GR Dimension: Height 33.5cm Width 25cm Thickness 4.3cm Features: Durable, Multifunctional, Environmental, Recyclable, Wear-resisting, Convenient Occasion: Offices, School, Business trip and more Package: 1 x Briefcase Notice Due to the light effect and other factors, actual colors may differ slightly from what it shows in the picture. Due to manual measurement, please allow 1-3 cm error. Thanks for your understanding. Looking for File folder ?